Maintenance chores such as weeding are still taking priority over additional garden improvements, but the parcel is beginning to take shape as a garden space. 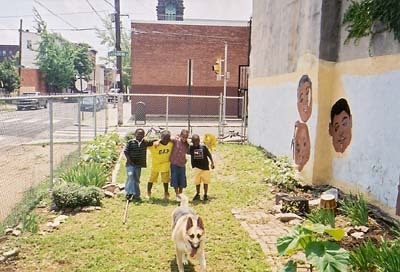 Shown here, several of the regulars, always eager to help dig and mow, not so fond of picking trash and pulling weeds. 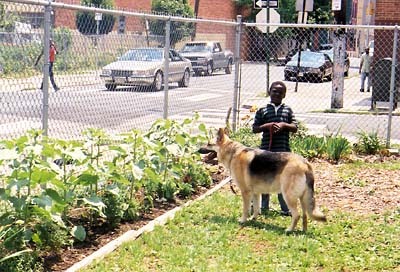 However, one of the adults on the block has recently taken over the task of keeping the walkways around the garden space clear of loose trash by sweeping and bagging. Neatly bagged trash set on the curb is certainly preferable to loose trash blowing around, and we are very pleased at this change. In the foreground at the lower right is one Pawlonia tree that we have decided to encourage for the short run to provide some shade until we have other plantings. There is a mulberry at the other end of the garden that we will allow to grow for a similar reason. 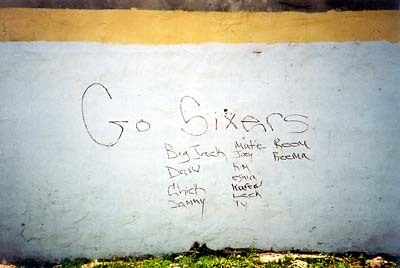 When the Sixers went to the finals, the older kids in the neighborhood showed solidarity by climbing the fence and writing on the garden wall. As Sixers fans ourselves, we can't yet bear to paint over it. The balance of showing pride in the Sixers while respecting the memory of Michelle Cutner will not be easy. 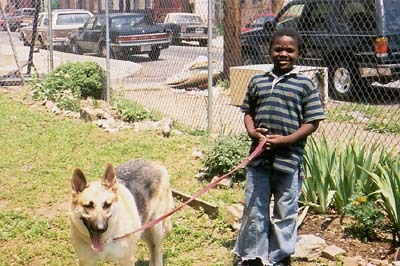 Kenyatta, shown here with Mr. Darcy the German Shepherd, has been the most faithful of the young helpers, and even found us an old lawnmower for our "lawn." The small border in the background includes the butterscotch-colored chrysanthemum, fevervew, achillea, rudbeckia, and iris. Shown behind Kenyatta and Mr. Darcy is the original triangular bed, with the new border on the side. 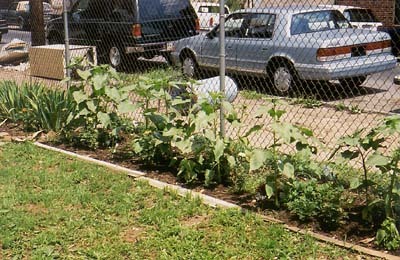 We chose sunflowers for the initial planting because of their strong visual impact. This is a sunflower mixture so we expect different heights, bloom size, and color. The new border, mostly planted with annuals. In addition to sunflowers, it includes begonias, marigolds, coleus, alyssum and a few perennials -- Sedum (frosty morn or similar cultivar), Malva moschata 'alba', Artemesia stelleriana 'silver brocade.' Not shown: coreopsis 'sunray' and Bouncing Bet (Saponaria officinalis). Friends and well-wishers have given us some wonderful plantings to add to the garden. With the exception of the few shrubs noted above, they are all being cared for in our backyard until later summer when the weather is cooler. Several people have given us hostas, which will probably be planted at other locations until this garden has some shade to offer them. Although portions of the garden are shaded by the house on the west side, the summer sun beats down relentlessly until about 2:00 p.m., which is not an ideal environment for any hostas. Water is also a problem -- we can hook a hose to the fire hydrant on the other side of the intersection, but bringing a hose, getting the necessary hydrant hook-up equipment from its storage place, and getting things in place is a considerable chore.